We went out and found the best and highest-quality chess sets for players on a budget. Chess is about the strategy, the movement of the pieces across the board, and the beautiful sacrifices necessary to conquer the opposing king. In addition to the game itself, it’s also about the equipment used to play. 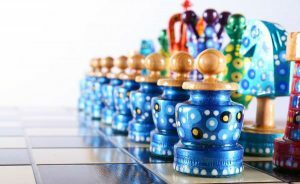 Over the years, we’ve seen all sorts of chess sets – from basic-but-functional ones to stunning works of art that are almost too beautiful to touch. 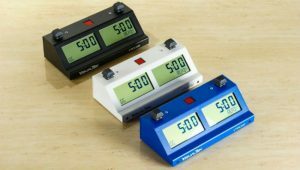 Some players love the look and feel of high-quality chess equipment but don’t have multiple hundreds or thousands of dollars to spend on a chess set. For those folks, we’ve searched out cheap chess sets that are all under $200 while still being individual works of art. 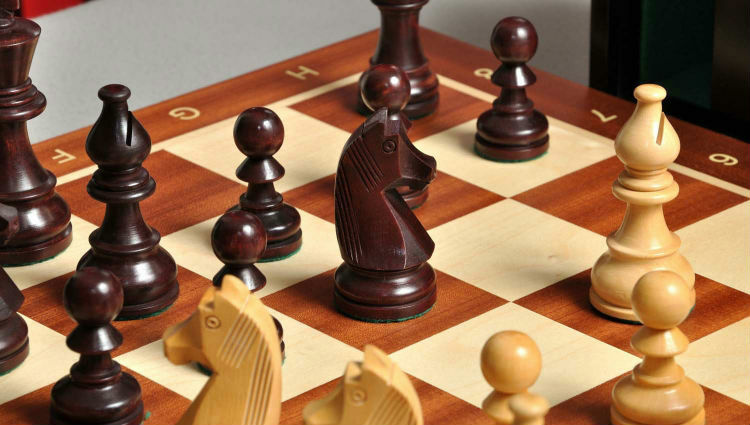 From hand-carved wooden pieces to gorgeous marble pieces that glide across a marble board, our affordable chess sets are sure to please any player on a budget. It’s every chess lover’s dream to play with tournament-quality equipment. 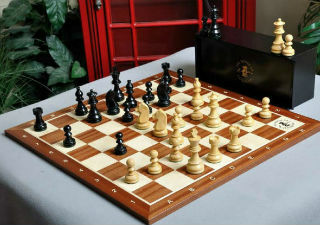 That’s why we were excited to find The Championship Series Chess Set, Box, & Board Combination. 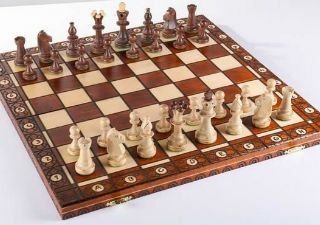 While its price is low enough for it to earn a place on our list of cheap chess sets, its pieces are a beautiful reproduction of the European Pattern Chessmen used over the past decade in all major international chess events. This set is a perfect blend of price, functionality, and quality. 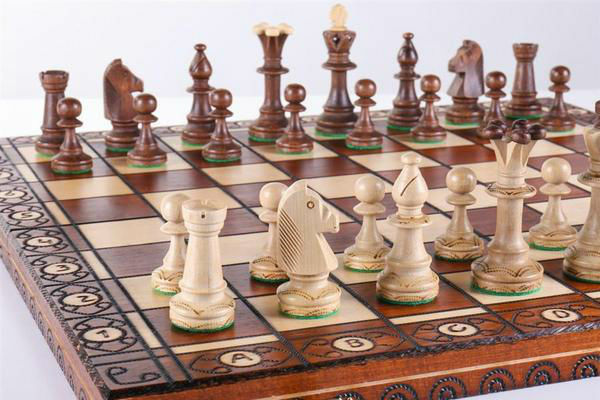 The chess pieces in this set are beautifully hand-carved out of Golden Rosewood and Natural Boxwood, although for a small up-charge, upgraded wood options are available. The pieces are nicely weighted and feature billiard cloth bases. The king measures 3.75 inches high, with a base diameter of 1.5 inches. 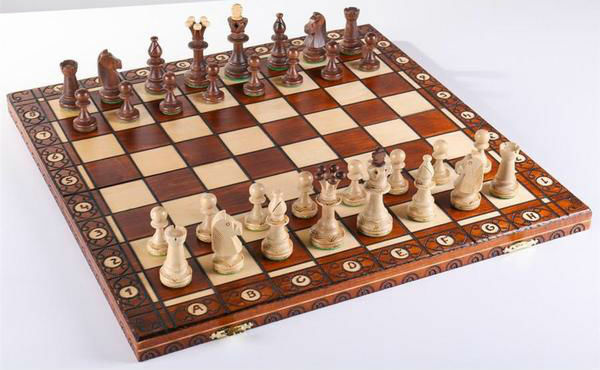 The tournament chess board is made from gorgeous Mahogany and Maple. It measures 21 x 21 inches, with a square size of 2.25 inches. You may choose a chess board (at no additional charge) with notation, with the House of Staunton logo, with both, or without either. For a small up-charge, upgraded wood options are available. 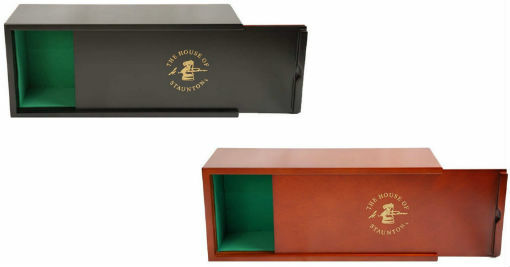 This set comes with a mahogany or black slide-top box that’s divided into different sections and lined in green velour to store and protect your chess pieces. We also recommend adding on a chess board carrying bag – especially if you intend to take your set with you to your local chess club. With its beautifully-crafted board and pieces and the inclusion of a gorgeous storage box, The Championship Series Chess Set truly is the best value for your money. 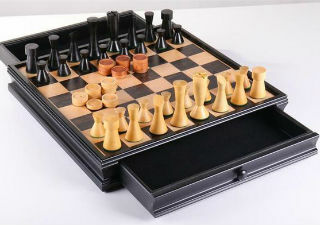 This cheap chess set offers two games in one, doubling its value! You can play either chess or checkers on the board’s patterned surface, switching between the two with only a moment’s notice. Since the set comes with all the pieces you need to play either game, along with plenty of built in storage to keep them in, it’s easy to sit down for a game or two any time you like. The Modern Chess & Checkers Set with Storage definitely delivers on its name- not only does it provide pieces and storage for both games, it does so all in a stylish, sleek, and modern package. 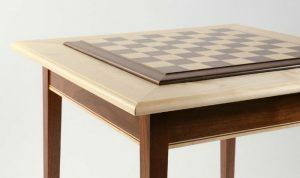 With its elegant look, it will look good on any chess table, desk, or coffee table. No one would ever guess by looking at it that this cheap chess set has such an affordable price tag! 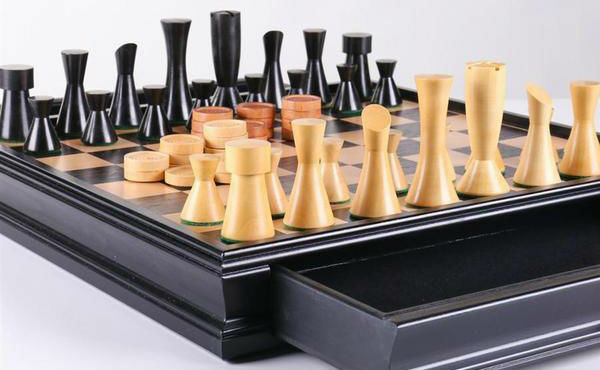 The cheap chess set pieces are made from Kari wood that’s been handweighted and polished. 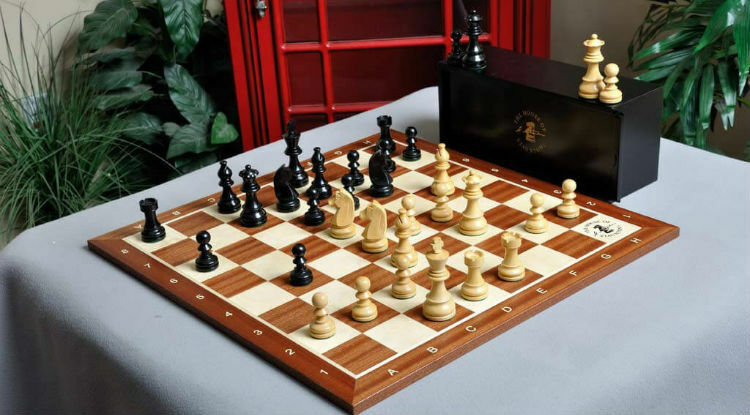 The chess board is a compact 15 inches square, so it will fit practically anywhere. The squares are 1 ⅝ inches, a size which perfectly accommodates the 1 ¼ inch base of the 3 ⅛ inch tall King piece, or the 1 1/16” round checkers pieces. Each checkers piece weighs about 2.6 ounces, and the King pieces of the chess set each weigh 1.2 ounces. All together, the complete set weighs in at just under 25 ounces total, so it’s perfectly portable if you want to take it on a trip or to a chess club meet. This cheap chess board looks anything but. It features a very unique and decorative antique design, and the pieces are nothing to sneeze at either! 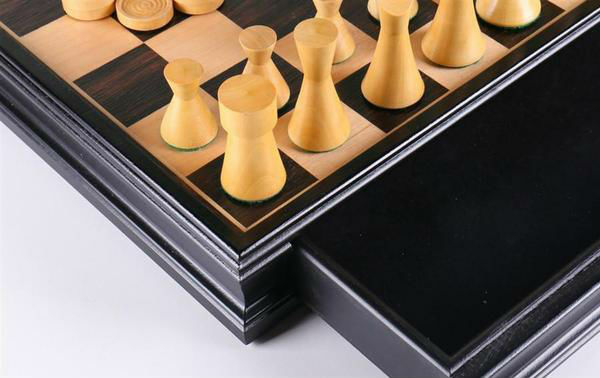 The foldable design of the chess board and the high quality workmanship that went into making this product make The 19” Consul Wooden Chess Set an incredible value for the money. Before we get to the board, let’s talk a little bit more about these cheap chess pieces. Of course, we mean that they’re cheap in price, NOT in quality! These chess pieces are carved in fine detail by Polish artisans. The King piece stands an impressive 3 ½ inches tall, with a 1 ⅜ inch diameter base to support it. Cheap in price, NOT in quality! 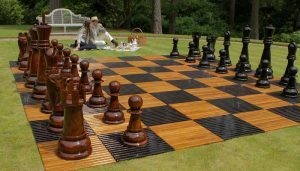 The chess pieces have plenty of space to move around on the 18 ¾ inch square chess board, with is spacious 2 ½ inch squares. The cheap chess board’s foldable design strikes a perfect balance between play space and portability, since you can easily fold it up and fit it in a bag when you want to transport it. You may be thinking, “but what will I do with all the chess pieces when I fold up the board?” Not to worry! The board actually includes padded storage space for each individual piece. This storage space isn’t visible while the board is in use, because it’s on the underside of the play surface and only functions while the board is folded up. With all the features this beautiful board has, you may be surprised to learn that its price tag is only in the double digits! When you hear “cheap chess set,” you might think of one that’s made of inferior materials. All of the ones we’ve chosen, however, are affordable as well as being truly high-quality chess sets. 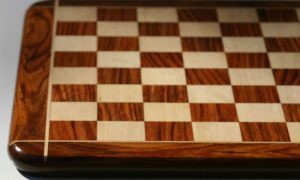 Even if you don’t want to spend a lot of money, you want to purchase a chess board and pieces that will be a joy to use and that will last a long time. Here are a few things to consider as you work to balance price and quality. One of the joys of chess is playing on a sleek and elegant board with pieces that are enjoyable both to look at and to handle. Just because you don’t want to spend a lot of money doesn’t mean you have to opt for a run-of-the mill set without any wow factor. 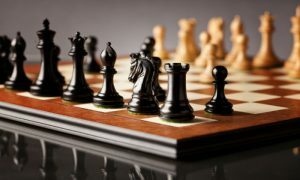 We love cheap chess sets that are both affordable and beautiful – and as our list of reviews shows, there are some truly great ones out there. If you go for an incredibly cheap chess set, you’re likely going to end up with a folding board made of cardboard with plastic pieces. These are functional, but they’re not very nice to look at and they’re certainly not made to last. For a bit more money, you can still find a chess set that’s affordable but is made to last for years. 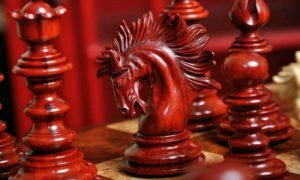 Wooden and stone chess pieces don’t have to cost an arm and a leg, and sets featuring such quality pieces will last much longer than a department store chess set, making it worth the money. Something else to consider when you’re looking for a cheap chess board is whether or not you plan to travel with it. If so, you may want to opt for a board that comes with some sort of storage for its pieces, whether it’s storage underneath the board itself or a separate storage box. It’s also a good idea to spring for a board bag to protect your board from being scuffed or scratched while on the go. If you still haven’t found the one you’re looking for while perusing our reviews of the best cheap chess sets, don’t give up! Take a few minutes and wander over to our reviews of The Best Travel Chess Sets. The sets on that page are designed specifically to be packed up and taken with you, but even if you’re just looking for an affordable set to play at home, you’ll find those to be beautiful and of the best quality. Have fun looking – and happy playing!